Hi, good afternoon.. Regarding in your rooms, can u accommodate us as a group of 13 pax in one room? for an overnight on october.. how much is ur rooms for the aircon @ non - aircon? I will wait ur response asap.. thank you! Hi! I have no Visa/Credit Card to use for my reservation. How can I have my reservation because we want to visit this coming month of june. HOW MUCH IS YOUR ROOM GOOD FOR 2..AIRCON AND NON-AIRCON PLS... THANKS..WILL BE VISITING GUIMARAS THIS COMING MAY 1 THANK YOU..
How much is your beach front cottage per night? scheduled to visit guimaras this October 25 to 28, please give me affordable room rates for 4 person. 09228769805. thanks. hi..im planning to go in your place this end of this month ,,can i have your latest room rates, good for 2 pax..aircoin room pls.. tnx. how is the budget we go there ? hi! can u pls send me your room rates and do u provide a boat to rent back and forth from main guimaras? hi, pls can u send me the accommodation rates and features of ur resort. thank you so much! Hello! please send me the complete list of your room rates and its facilities. We are planning to stay there for a couple of days this coming late March or early April. Thank you! can u send me ur room rates for 2days and 1 night? do have boat for rent for back and forth plus island hopping? kindly send me ur infos.esp contact number pls. hi! can u pls send me a quotation of ur room good for two... wer planning to hve a two night stay.thanks! room rates please? doyou have family rooms? hello po, would like to know your how much is the room rate per day and pictures please..
wanna ask if u have the capacity to handle a maximum of 100 pax for 3 day affair?in addition, i wanna ask your room rates.tnx. Hi! room rates please for atleast 15 persons, and how about the food? hi, please send me your room rates good for 20 people and for your activities too. Thanks. hi, please send me your room rates good for 20 people and for your activities as well. Thanks. Do you really have fishing pond, island tram tour existing for guests? Please let me know. I'll come with my students on July 6-7, 2011. How can i go there? Thank you. Good Day!!!! please send the best rate of your room.. march 11 to 13, 2011 ang vacation namin. 6 persons po kmi, need po namin un 3 bedrooms by partner po kc kmi. and pa send dn po ang ibang picture.. please send po asap.salamat poh.. Hi! !Gud day..could you pls send us information of your resorts? amenities,room rates,etc..thank you..we have plan to visit your resort this march 10. Can u pls send me ur room rates or if ever u have a package for a overnyt stay or 2 nights..
please send me your room rates and packages.. thanks! Please send me the room rates and pictures. Also, if you can give me the rate for a week vacation that would be great. Thanks a lot. hi! me and my officemates are going to guimaras on Nov.14.. we will stay until 19.. can i ask for your all your rates? thank you! how much per night we are 6, and how can we get there, were coming from bacolod city on nov 8. pls give me the details. Hi my family will be going to Guimaras from Iloilo from Nov. 4-6. I just wonder how we can go to your resort from Jordan warf and how much would be an aircon room per night, (a couple and 2 kids). Hope to hear from you, thanks! hi, just want to know the room rates for 2 do you have rooms with air con, i will be on my honeymoon Feb 27th 2011- leaving March 4th 2011. also how to get there from Bacolod do you have photos of the room? Hi! Room rates pls. for 3 kids & 2 adults (sometime in weekends of Oct.) Thanks. Hi! i would like to know your room rates can you email it to me, we are planning to have a vacation on november. pls email your room rates and tour packages for students. Good Day! We would like to stay in your resort by Nov. for 3 days and 2 nights. Kindly email me the rates including all of your offered services and accomodations. Thanks! do you have room rates for 4 persons on nov3-4? room rates pls. oct 8 and 9? ask lang ko kung panu makakad2 from jordan wharf? anu pwd sakyan then pila pamasahe....or may package offer kamo? we are composed of 5 persons planning to there in your resort on June 19-21, 2010...please give some information...ur packages/ offers....thanks! hi! we're planning to visit ur resort on august.. can u pls send me info. regarding the entrance and cottage fees, room rates and pics of ur amenities as well.. thnx! 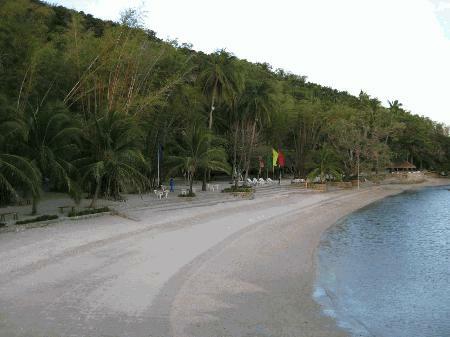 Hi, we are planning to go there in Guimaras, will u send us pls. ur room rates & other accomodations.tnxs. Could you please send me information about the rooms, capacity in each room and rates? Can you go swimming in the beach? There was no picture of people swimming in the beach. pls send me the rates of the rooms and how to reach the resort. we plan to visit guimaras by may 1-3.tnx! hello, gud evening. i wud lyk to ask for room rates (for 3 persons) and directions on how to reach your place. thank you. Hi!our company is planning for this labor outing which is on May 1 to 2. We would like to inquire if how much is the entrance fee at the same the the rooms rates (fan & airconditioned). With an estrimated no. of employees of 50+ to attend. And is it allowed to bring our own food at the same time drinks. thank you so much. kindly send us your quotation at the same time photos of the resort to our email address. Good day! Can you e-mail me your room rates and amenities? especially your group packages. Thanks! Pls email ur room rates and other details like entrance, and how can get there were from bacolod. Do u charge if incase we bring food.pls also include other facilities is it free or with charge. tnx! goodevening! i would like to ask about your room rates? and other failities? please reply asap. thanks! Hi. i would like to ask for your room rates? can you please email me your rates and pics of your room. thanks! We are planning to stay there on April 9 to 11,2010.We're from bacolod, from here how can we reach C.A., how much is ur room rates?we r 4(3 adult s & 1 kid 6yrs). hi there.. i'm planning to go ther together with my family on march 19, 2010, friday.. i want to know your room rates and cottages.. are outside food also allowed? Hi, we saw in the internet your resort and we would like to know how much it would cost our family to stay there for 3 days/2nights. We are a couple and 2 kids below 12 years old. Do you have aircon rooms? We do plan to visit Guimaras this November. Planning to be in Guimaras on Feb.28-March 1. Kindly give me rate of room and pick-up from Jordan Wharf. Thanks. can you send me your room rates and some pics? thanks! pls send me your room rates..thanks!!!! Hi...Just wanna inquire if you also accommodate wedding packages? hi! how far is this from iloilo city? how do we get to this resort from iloilo? How much is the rate? How about food? do you have a package for this resort, including transfers and tours? Also, please send me a picture of the rooms and the beach. Thanks so much!!! hw much the room rate november? We are interested in 2 beachfront cottages for March 27-March 29. What are the rates and availability? Thank you! hi, we'd like to know how much your rates are (for September 2009) and how to get there from Iloilo. Kindly email the details. Thanks. Hi, I would like to stay in your resort on Oct 15-19. may I know which flight to take to get there? Is it Manila-Bacolod or Manila-Iloilo flight? Thanks! how much room rate for 3 / 4? a/c, inclusive of what? Could you please e-mail me the your room rates. Thank you. Hello, May I know the room rates wit AC room for 2 pax on July term. Thanks. hi! id like to know your room rates. air condition rooms for 2 pax. thanks! hello!can you please send me your room rates on august...please...thank you! Hi. I'm planning to go there this Saturday, May 2, 2009. I would like to inquire how much is your room rate with aircon for 2 persons. Please email me asap. Thanks! how mush your room rate/night? hi may i know how much are your room rates..thanks..
hi, its better if you post a picture of the rooms with its rate. my friends and i are looking for a resort to stay for 4 days and 3 nights on may1-4. can we ask for a cellphone number for easy access.. we are from bacolod by the way. hello, we'll be visiting the island on June. i'd like to know your room rate for two. thanks thanks! hi, I would like to inquire if you have services such as day tour? We are planning to visit Iloilo on Oct & we decided to stay in the city. But also we would like to explore a particular resort for a day. Is it possible for us to come to Costa Aguada Island just for 1 day & explore it's facilities? If yes, how much would be the charge? Hope to hear from you soon. Thank you! can i have your contact no.?thanx. plz send me your room rates for 2.. and please direct us how to get in the place from iloilo. tanx! i'm planning to visit guimaras this june with my wife and 4kids. how much is your rate for a room na kasya kami, 2N/3D. How far is your place from the airport. Niid ur immediate reply kc mag early booking ako for our flight. Send me also other pics of ur resort. thanks. hi! whats your room rates? am planing to stay in your resort for two nights can you send me th rates fo double..thanks! Good Day! How long does it takes us to go to your resort from Iloilo City and how much is your room rates? Thanks! hi! i would like to know your how much is the room rate per day and pictures of the cottages. i just wanted to know your rates for the dates: april 3-5 and 10-12 Thanls! Hi! do you have cottages for rent? because we're just planning for a day swimming. I want to know the rates. pls send me some details. Thanks! hi! we're visiting the island next month and I'd like to know the net per day for your room rates. please. We're interested in staying at your resort. Thank you. if possible to change the contact no. (0632) 896-5422; 75236-88 telefax no. (632) 890-5543 makati sales office instead of Bacolod...and where do i send/ attached the pictures? plz.. attach pics so that we could see how beautiful your island is..ty.. plihog butng pics para mkita nmon kn ano kattahom ang inyo isla..salamat..kad2 gd kmi da..see yah..ty..